Gothamist is reporting that a pilot program has been launched to make NYC public payphones into free WiFi hot spots. The article seems to suggest that the sides of the phonebooths would indicate the free WiFi and that there would be no advertising on the kiosks, but that seems strange considering phonebooths already are used to advertise. The article also seems to suggest that the cost of installing and maintaining these WiFi hotspots would be borne by the advertising firms. If the function of the phones at these phonebooths is any indication of how good maintenance will be, many of these locations will likely not work. 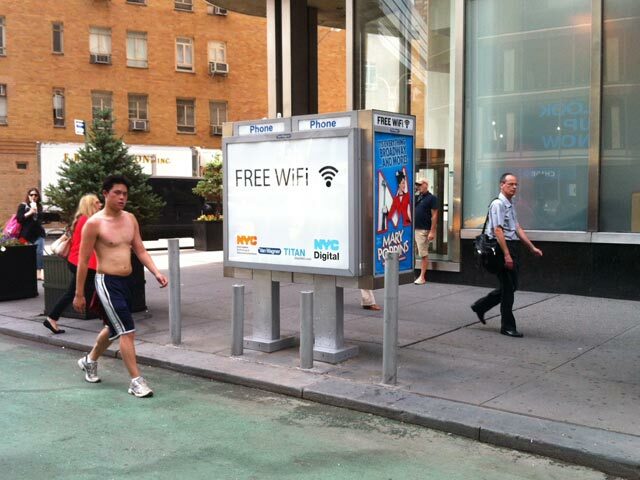 In many ways this seems like a ploy by the ad companies to keep phonebooths relevant in a cellular world.